Fifty four years ago, this week, at 12:30pm on November 22, 1963, John F Kennedy was shot while riding in a presidential motorcade in Dealey Plaza in Dallas, Texas. According to the commission of inquiry launched to investigate the assassination, the blame for the murder officially lay solely with Lee Harvey Oswald. Public opinion polls have consistently revealed wide-spread skepticism about this explanation. Speculation of a conspiracy of some kind involving multiple accomplices flourished. A popular alternative view was that Oswald, who was later shot while in police custody by Jack Ruby, was used to divert attention away from the real assassin(s). Multiple books on the assassination have been released over the last five decades. Persistent doubts about the official JFK narrative drove Congress to call a House Select Committee on Assassinations in 1976. The final report concluded that “President John F. Kennedy was probably assassinated as a result of a conspiracy” albeit without specifics relating to the identities of other conspirators or the extent of said conspiracy. In 1991, JFK, a blockbuster movie by Hollywood director Oliver Stone detailed many of the anomalies in the official story of the Kennedy assassination. 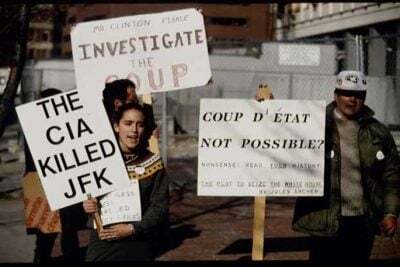 The interest generated rekindled the JFK controversy and led to the passage of the President John F. Kennedy Assassination Records Act of 1992 with the goal of collecting at the National Archives all known records of the assassination and eventually making them publicly available. Yet in spite of President Trump’s earlier comments suggesting he would not block the release of the remaining records, he apparently succumbed to pressure from the CIA, FBI and other federal agencies and delayed the full release of documents. Despite their differences in temperament, policy and popular acceptance, both President Kennedy and President Trump appear to have one characteristic in common: a foe in the CIA and other elements within the US intelligence apparatus. If John F Kennedy was assassinated by this ‘Deep State’, a commonly held belief, then what are the implications for democracy-aspiring citizens in 2017, and a president who may have the audacity to believe that he can ‘take charge’? This question forms the core focus of this week’s JFK anniversary edition of the Global Research News Hour. Ray McGovern is a former CIA analyst with 27 years in the field. He is also a co-founder of the group Veteran Intelligence Professionals for Sanity. McGovern is convinced that there is likely very little to be gleaned from the new releases of JFK documents (there have been three since the October 26th deadline.) In this interview with the Global Research News Hour, McGovern explains that the real story is in what is being withheld from scrutiny, and how the delay suggests another front in the Deep State’s siege against a sitting president. Paul Zarembka is Professor of Economics at the State University of New York at Buffalo. He has been General Editor since 1977 of the annual hardback Research in Political Economy, published by Emerald Group. He edited the 2006 work: The Hidden History of 9/11, and in 2015, authored a paper about the weaponization of the term ‘conspiracy theory’ in relation to the Kennedy assassination, 9/11, and similar alleged ‘state crimes against democracy.’ In the final interview of the program, Zarembka accounts for the resistance of some on the Left, including Marxists, to confront the very notion of government conspiracies, and addresses the dilemma of misinformation not only within the mainstream but also within supposed ‘alternative’ news sites.